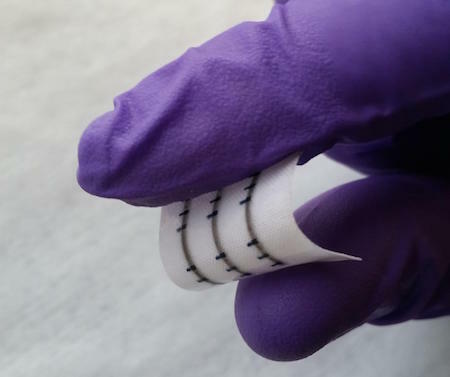 Today, hard-working researchers at the University of Cambridge have printed washable, stretchable and even breathable integrated electronic circuits for the first time ever. The new method directly prints graphene inks and other two-dimensional materials on fabric to produce integrated electronic circuits that are comfortable to wear and can survive up to 20 cycles in a typical washing machine. The technology opens up new applications of smart fabrics ranging from personal health to wearable computing, military garments, fashion, and wearable energy harvesting and storage. Based on earlier work on the formulation of graphene inks for printed electronics, the team designed new low-boiling-point inks, allowing them to be directly printed onto polyester fabric. They also found that roughness of the fabric improved the performance of the printed devices. The versatility of this process also allowed the researchers to design all-printed integrated electronic circuits combining active and passive components. There are earlier mentions of this idea in science fiction, depending on how you interpret it. For example, consider the sleeve communicator from Murray Leinster' s 1945 short story First Contact.